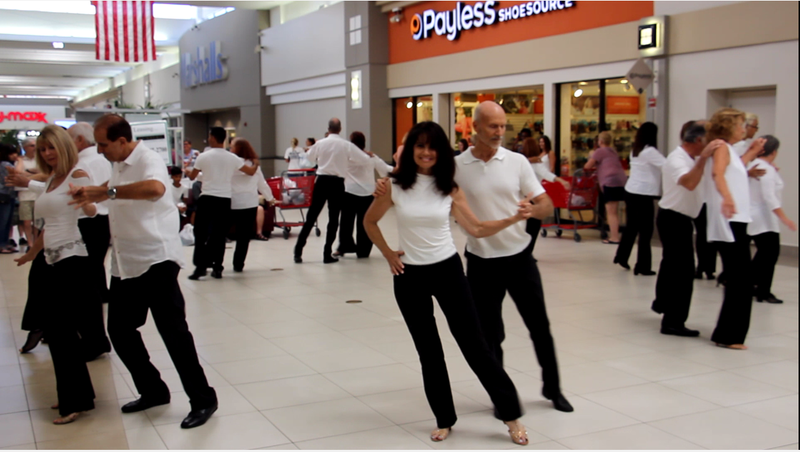 Our Chapter Flash Mob Team had a great time bringing the joy of ballroom dancing to three Malls on Saturday, September 22, 2018, as part of the USA Dance Nationwide Flash Mob Contest and performances for National Ballroom Dance Week. Image 1 (Above): Our ever-present Banner! 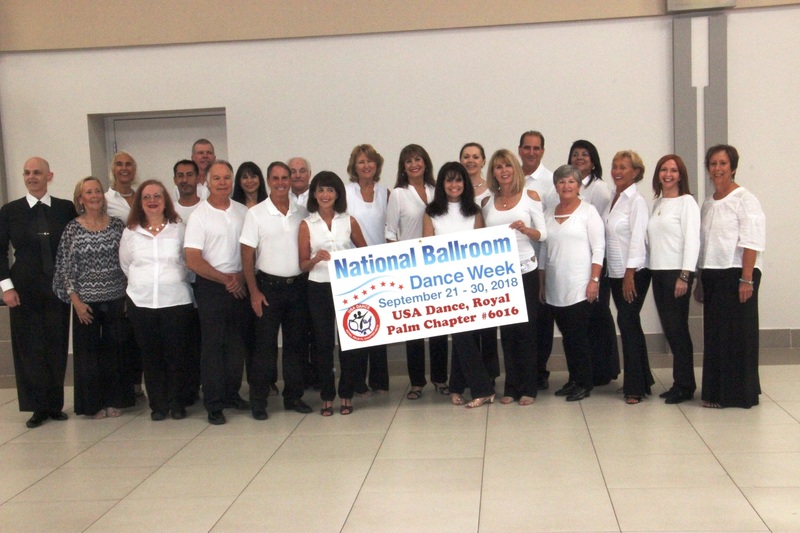 Happy National Ballroom Dance Week from the USA Dance, Royal Palm Chapter # 6016! 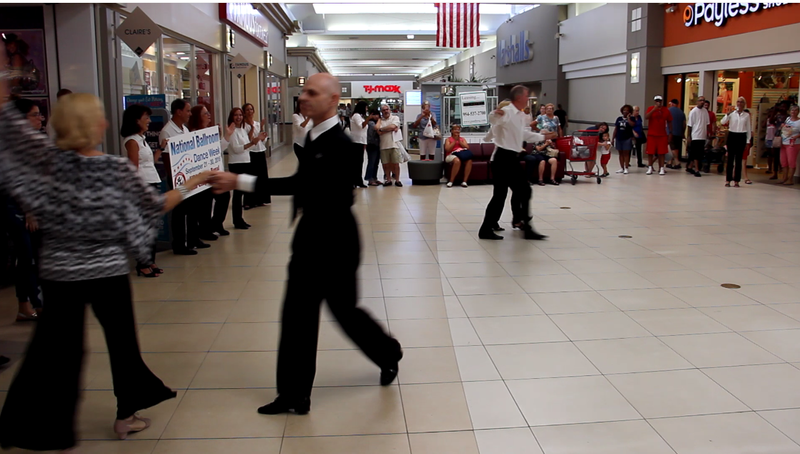 On Stage at the Festival Marketplace in Pompano Beach, FL, to the music of Michael Feinstein’s “Swing is Back in Style,” our Team had a great time performing the fun Swing/ Foxtrot routine choreographed by USA Dance Vice President DanceSport Giaccomo Steccaglia and Vice President Professional Dance Melissa Dexter. Many thanks to our Great Team Coach and Instructor, Lee Fox (pictured foreground below), who taught us and helped us all so much in learning the routine! Lee is a Dance Professional & Championship Certified USA Dance Adjudicator, whom we are very fortunate to have as our Chapter Vice President and Board Member. 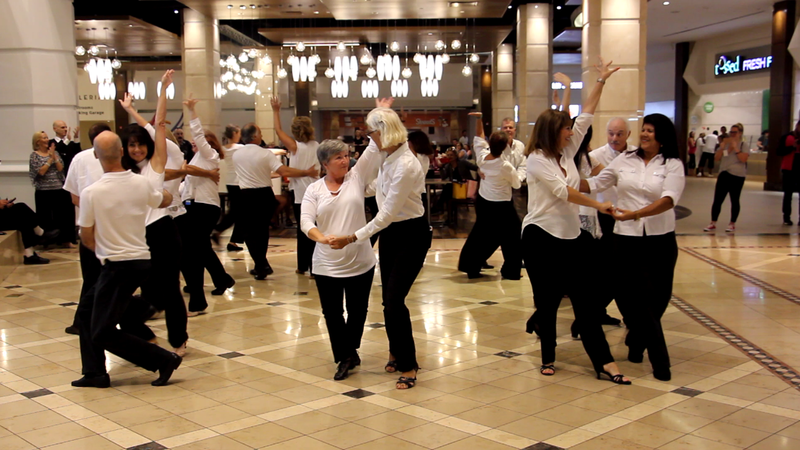 Image 2 (Above): Pictured Left to right: Sharon Youmans with Cristian Mellado; Gina Sauber with Fred Marjenhoff (background); Paula Mendelsohn with Jody Dancer; Lee Fox with Elizabeth Coldren (foreground center); Aaron Boorstein with Diane Paley (backing camera); Eileen Waech with Phyllis Shinn; Angela Territo (visible in background). 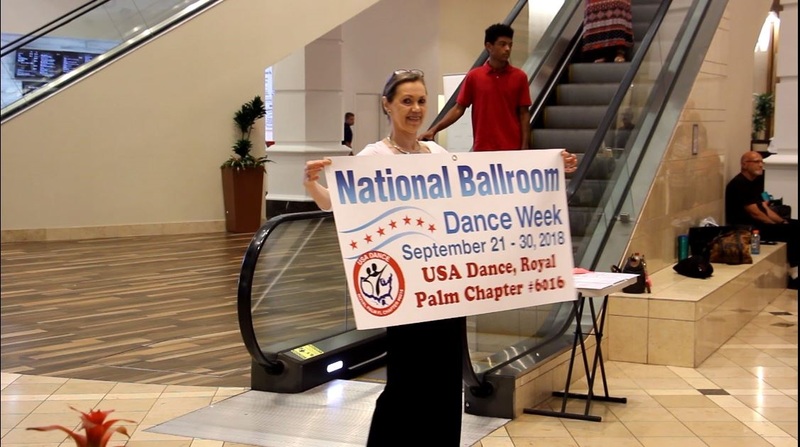 Many thanks to Millie Ledoux (pictured below, left), Certified Dance Teacher and Secretary and Membership Chair of our Chapter, who ably assisted Lee Fox in teaching and preparing our Team, and conducting Practice Sessions for us. Image 3 (Above): Pictured in foreground (left to right): Millie Ledoux with Angela Territo; Ralph Weir with Debbie Krupp. 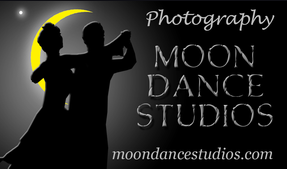 Image 4 (Above): Pictured left to right: Cristian Mellado (backing camera), Paula Mendelsohn with Jody Dancer, Elizabeth Coldren with Lee Fox, Diane Paley with Dr. Aaron Boorstein, Phyllis Shinn (backing camera) with Aileen Waech. 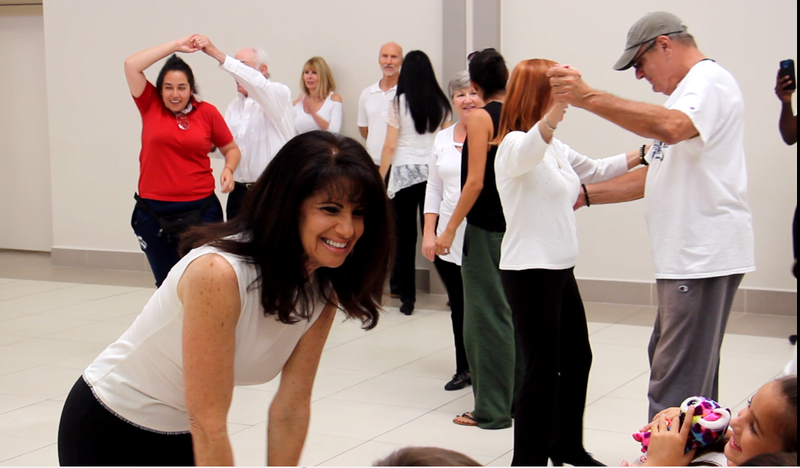 Image 5 (Above): Pictured left to right: Jill Fragale with Ernie Arcaro, Gina Sauber with Fred Marjenhoff, Sharon Youmans with Cristian Mellado, Paula Mendelsohn with Jody Dancer, Lee Fox visible in background. Image 6 (Above): Pictured left to right: Millie Ledoux, Debbie Krupp with Ralph Weir, Patricia Piorier with Kim Poirier, Jill Fragale with Ernie Arcaro; Gina Sauber (backing camera) with Fred Marjenhoff. Dear Friends from our Chapter came to watch and cheer us on! Front Row, left to right: Nancy Price, Nan Miceli, and Chris Sommerhoff. Image 8 (Above): Pictured in foreground, left to right: Gina Sauber with Fred Marjenhoff, Phyllis Shinn with Aileen Waech, Angela Territo with Millie Ledoux; Behind Millie and Angela: Dr. Aaron Boorstein. Image 9 (Above): Pictured in foreground, left to right: Jill Fragale with Ernie Arcaro, Gina Sauber with Fred Marjenhoff, Eileen Waech with Phyllis Shinn, Millie Ledoux with Angela Territo (backing camera). 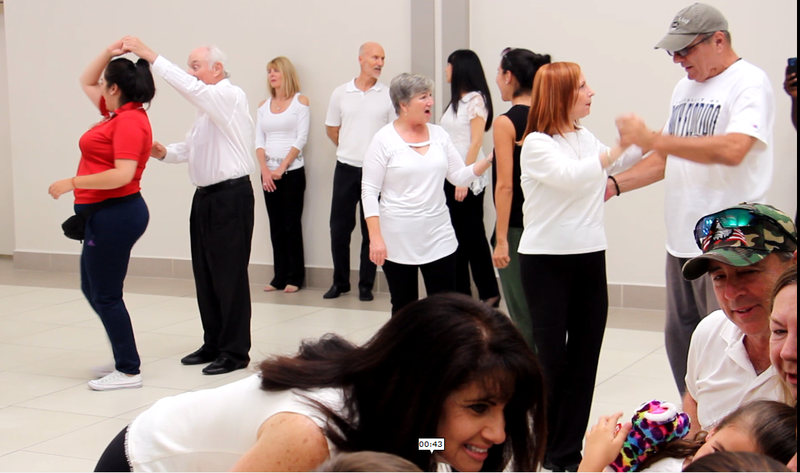 Image 10 (Above): Pictured in foreground, left to right: Elizabeth Coldren with Lee Fox, Debbie Krupp with Ralph Weir, Patricia Poirier with Kim Poirier, Sharon Youmans (side to camera) with Cristian Mellado. 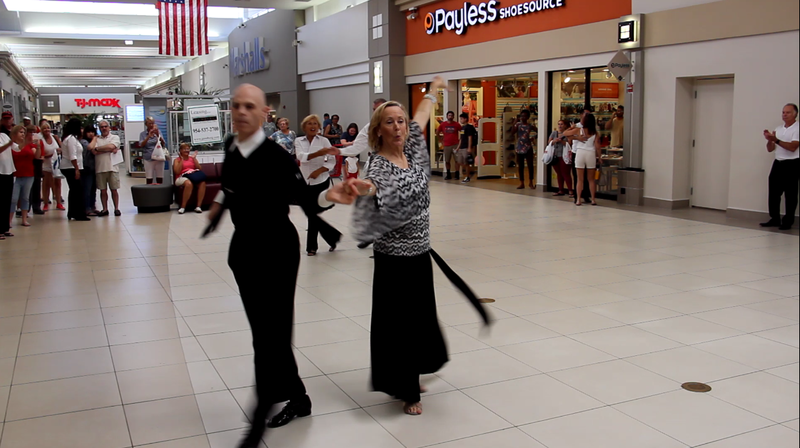 Image 11 (Above): Pictured in foreground: Jody Dancer with Lee Fox. In background: Marcia Miller with Al Guzzi. 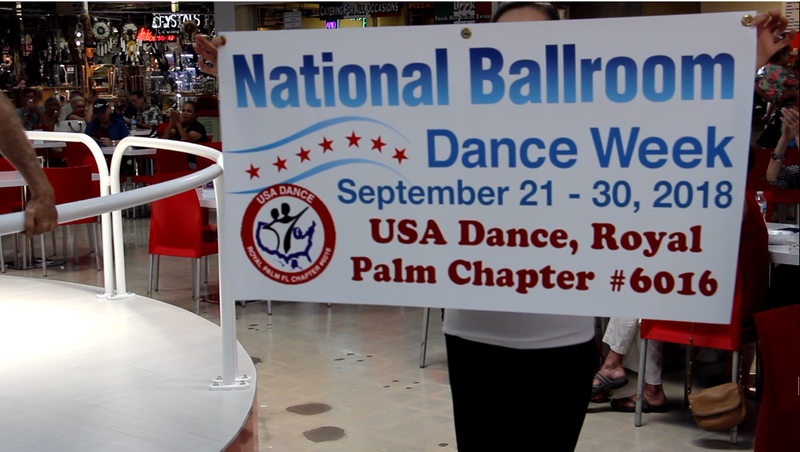 In the background, Chapter President, Connie Barnhart Koontz, tended the Banner and the mic, and encouraged shoppers and onlookers to pick up materials at our table by the escalator, to learn about USA Dance, our Chapter, and places to dance, while our Chapter Videographer and Photographer, Lee Ranger (not pictured), recorded the event “for posterity,” and Board Member Dave Koontz (not pictured) played the music and tended another camera. Image 12 (Above): Connie with Banner, table & flyers. 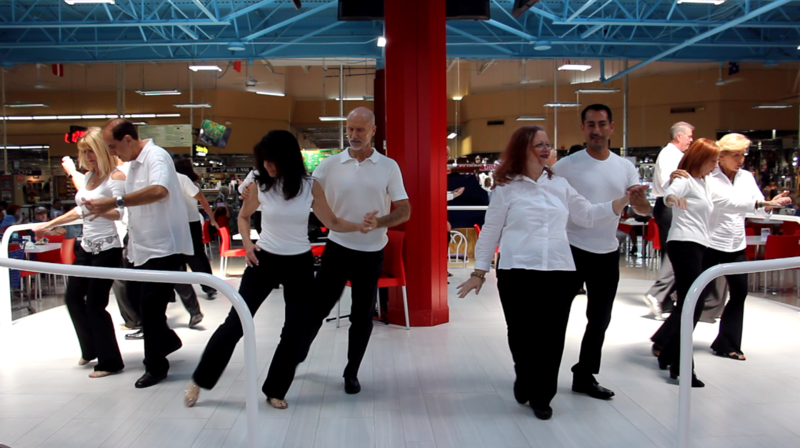 Image 13 (Above): Pictured in foreground, left to right: Angela Territo with Millie Ledoux, Paula Mendelsohn with Jody Dancer, Elizabeth Coldren with Lee Fox, Cristian Mellado with Sharon Youmans (backing camera), Ralph Weir with Debbie Krupp (backing camera). 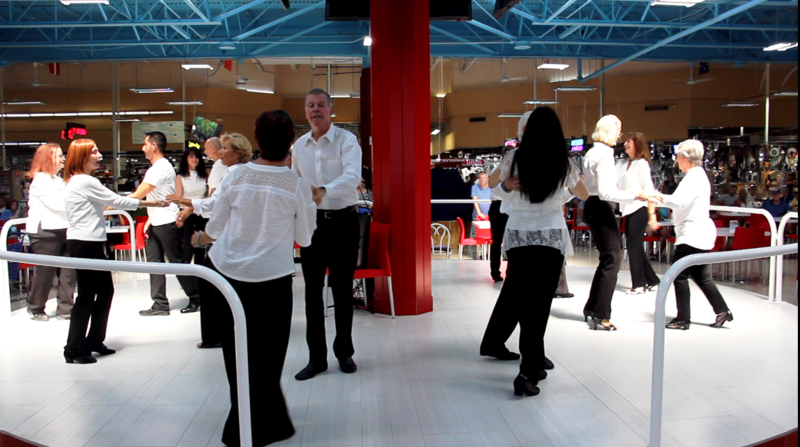 Image 14 (Above): Pictured in background (left): Fred Marjenhoff; Then, left to right: Kim Poirier with Patricia Poirier, Aileen Waech (backing camera) with Phyllis Shinn, Angela Territo (facing camera) with Millie Ledoux (backing camera), Jody Dancer with Paula Mendelsohn; Background (right): Lee Fox. Image 15 (Above): Pictured in foreground, left to right: Kim Poirier (with Patricia Poirier not visible), Phyllis Shinn with Aileen Waech, Angela Territo with Millie Ledoux, Paula Mendelsohn (backing camera) with Jody Dancer, Lee Fox (background). Image 16 (Above): Pictured in foreground, left to right: Jill Fragale with Ernie Arcaro, Gina Sauber with Fred Marjenhoff, Patricia Poirier with Kim Poirier. Image 17 (Above): Pictured in foreground: Al Guzzi and Marcia Miller; In background: Jody Dancer with Lee Fox. And some of the audience clapped along in time to the music! Image 18 (Above): Pictured in foreground: Al Marcia Miller and Al Guzzi; In background: Lee Fox and Jody Dancer. 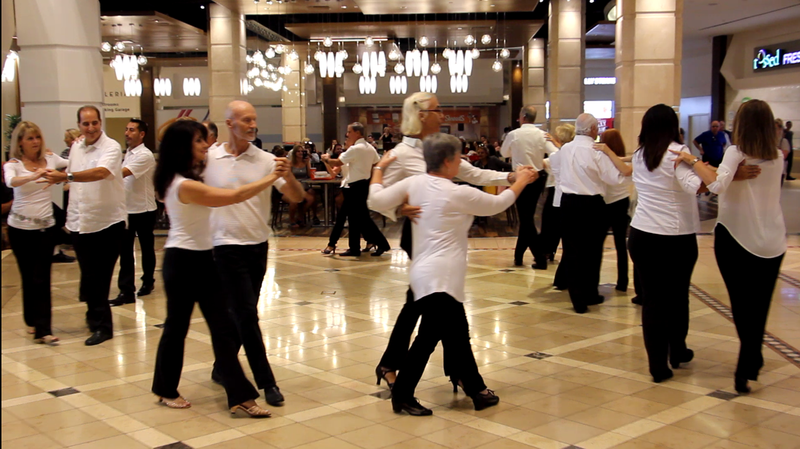 Then, after another Beautiful Waltz by Lee & Jody and Al & Marcia, we ended with a “Swing is Back in Style” Finale, in which our Flash Mob Team reached out and engaged audience members to dance with us! Everyone had a lot of fun!! All Ages of fun!! Image 18 (Above): Pictured, left to right: Audience member with Dr. Aaron Boorstein; Foreground: Gina Sauber reaching out to encourage a young boy in the audience to dance; Background: another audience member considering whether to dance with us; Right: Paula Mendelsohn teaching a Dance Step to an audience member. 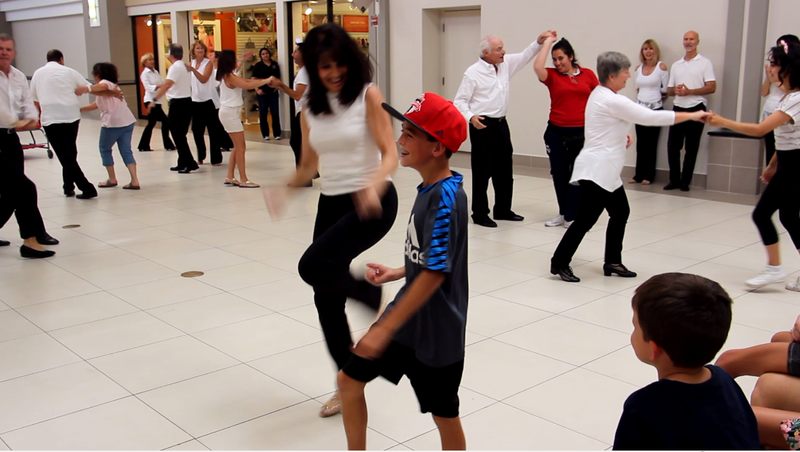 Image 19 (Above): Pictured, left to right: Dr. Aaron Boorstein in Full Swing with an audience member (red shirt); Gina Sauber still coaxing the young boy to dance; Phyllis Shinn discussing the possibility of dancing with an audience member; Paula Mendelsohn with audience member – Step 2; Further background: 3 members of our Team strategize who to ask next to dance: Jill Fragale, Fred Marjenhoff, Diane Paley (backing camera). Image 20 (Above): Pictured, left to right: Dr. Aaron Boorstein Swinging Away with the audience member (red shirt); Phyllis Shinn convincing the audience member it will be O.K. 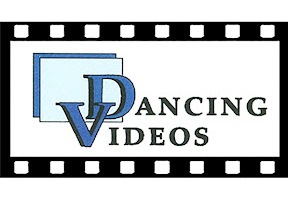 to dance! ; Gina Sauber still coaxing the young boy, and involving his whole family; Paula Mendelsohn with audience member – Step 3; Further background: 3 members of our Team still strategizing who to ask next to dance: Jill Fragale, Fred Marjenhoff, Diane Paley (backing camera). Image 21 (Above): Pictured, foreground: Gina Sauber did it! She persuaded the young boy, “Come On! I’ll follow you! Whatever you want to do! And, can he boogie!! 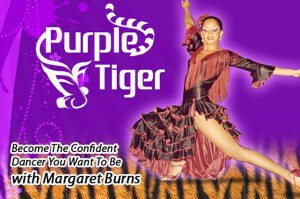 A future dance prodigy in the making! 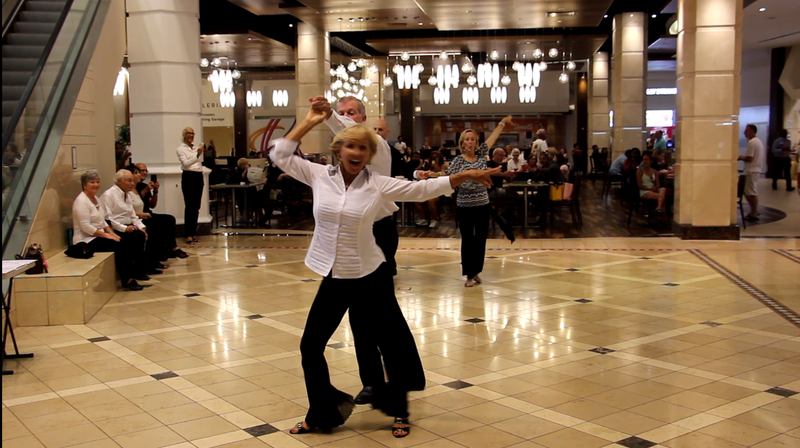 Background (left to right): Ernie Arcaro with audience member (pink top) who feels that rhythm and can dance!, Cristian Mellado with another audience member (white top) – another dance prodigy is discovered!, Dr. Aaron Boorstein still Swinging with the talented audience member (red shirt), Phyllis Shinn did it! Dancing with the audience member, who’s having a great time! Background: Other Team Members still strategizing and coaxing people in the store! Image 22 (Above): Same cast as in Image 21. Full Swing! Everybody’s having a Great Time! 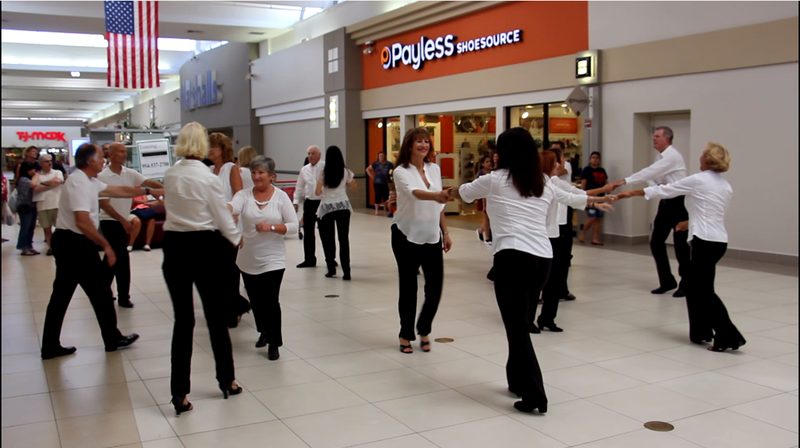 Image 23 (Above): Our Royal Palm Chapter #6016 2018 Flash Mob Team! Back Row, left to right: Aileen Waech, Cristian Mellado, Lee Fox, Diane Paley, Dr. Aaron Boorstein, Patricia Poirier, Angela Territo, Connie Barnhart Koontz, Ernie Arcaro, Millie Ledoux; Front Row, left to right: Al Guzzi, Marcia Miller, Sharon Youmans, Kim Poirier, Ralph Weir, Debbie Krupp, Gina Sauber, Jill Fragale, Phyllis Shinn, Jody Dancer, Paula Mendelsohn, Elizabeth Coldren. 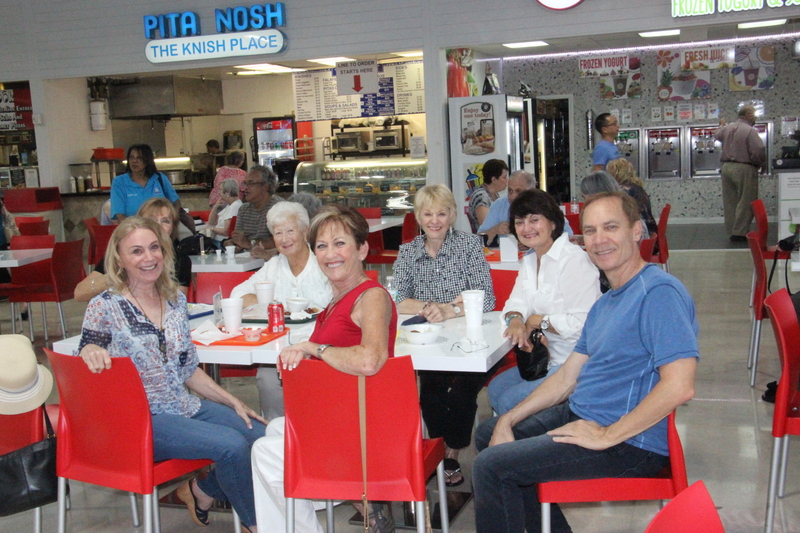 And, afterward, we capped it off with a fun Team gathering and afternoon snack at Einstein Bros. Bagels Cafe at Coral Ridge Mall Fort Lauderdale. 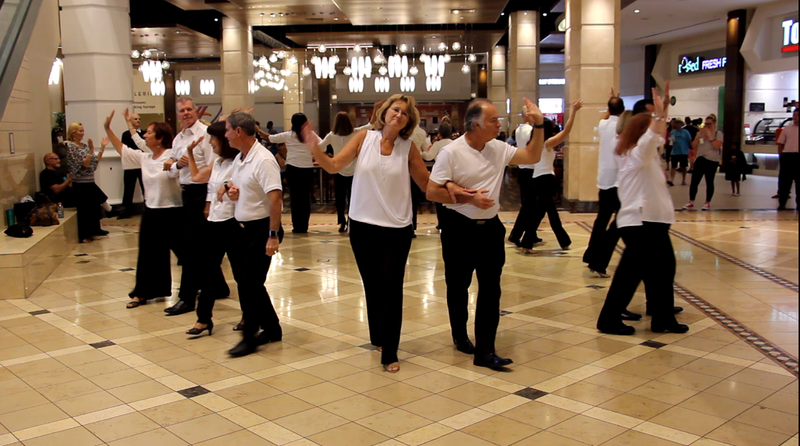 Special gratitude to Lee Ranger, for all the great photos and videos of our Flash Mob Events! Then, on to more classes and practice to prepare for our next two performances! 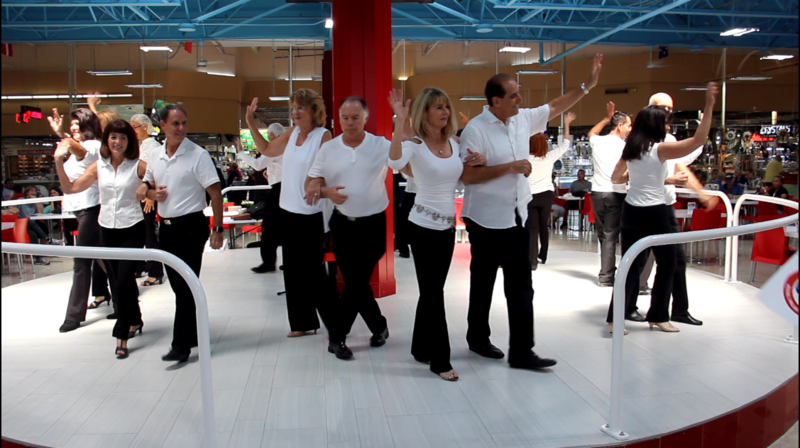 Our Team next performed at Goldcoast Ballroom, Coconut Creek, FL, at our monthly Chapter Dance, Tuesday Evening, October 9! 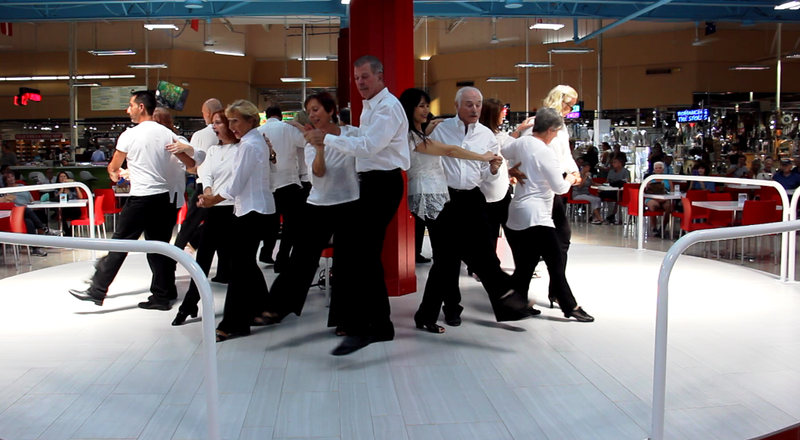 And, then we performed at a Showcase at Star Ballroom, Pompano Beach, FL on Saturday, October 20! 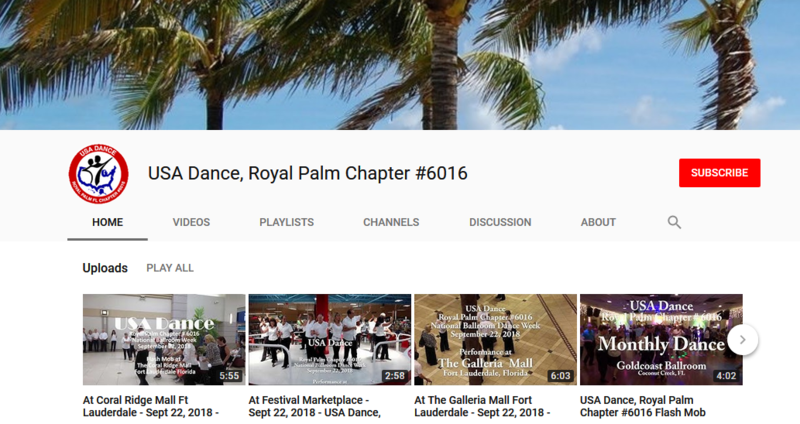 Royal Palm Chapter #6016 YouTube Channel!